MUFF WIGGLER :: View topic - Transpose Utility Module - who can handle pitch transpose? Transpose Utility Module - who can handle pitch transpose? I know that they are already some threads about pitch transpose, but let's have a fresh start. Unfortunately they only mostly handle one voice, or take too much hp. In a world where you can get 8 quantised sequences in a single module like the Malekko Votage Block, but can't transpose any of them, it's a pity that none of those modules can't transpose more than one sequence. They could be some unity mixers out there that are precise enough to handle pitch, but I don't know them, and searching the answer in the existing thread didn't helped me. You could add a pot to offset the input 0, to get octave or semi-tone transpose. What do you think about this idea ? Is there any modules out there who can do this ? EDIT : Leipzig West is now building the module I was looking for. I added it on the top of the list. Contact him if you're interested. Or get it from a dealer. Yup, it's true that there isn't much in the way of current modules that can transpose multiple voices at the same time, but there's lots of ways to to do it with individual modules. Which is really the nature of modular. I use the Ladik keyboard, patched into a sequencer's transpose input, or summed in a unity mixer, or patched into another input on an Osc. A second quantizer can do this as well. @Dcramer, do you have the K-011 expander as well? I recently got a 2hp Tune and have been looking for a module to transpose it, ideally under CV control. At first glance that Ladik pair looks perfect. There's another thread about the Instruo chord quantizer Harmonaig that is looking very interesting to me. It transposes and shifts inversions of chords diatonically and other ways. 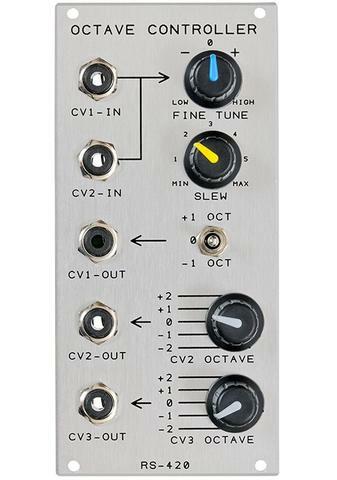 This is something I'm concerned with too as I expand my rack---I was wondering if Intellijel Shifty would be useful in this regard too. which unity mixer do you use ? from what I've read about Intellijel's Unity Mixer, it can't handle pitch or wasn't design with this in mind (using 0.1% tolerance resistors). what about Malekko's? It would be perfect to find a simple 2hp Unity Mixer designed with 0.1% tolerance resistors. I could be totally wrong but as far as I know a lot of analog VCOs have an exponential FM CV input that tracks 1V/oct if you crank up the expo FM attenuator. If that applies to your VCOs you could plug the transposition CV straight into your VCOs. The only additional module you'd need then would be an active multiple to distribute your main sequence to all your VCOs. that's a good tip. thanks. yeah, that's awesome. but I'm sure that if I get an O_C I would like to use it for something more complex than just a precision adder. but who knows, could worth the hp's. Well, it's not like you're locked in to it only doing one thing - with a press and twiddle of the encoder, it can be something entirely different if you want. I added the Leipzig West WK1 (2 hp) who looks promising. The manufacturer didn't knew how precise it was and he's gonna mesure that on the next batch. ALM Beast's Chalkboard is missing from your list. yep. did you try it with CV ? I've read on the Beast's Chalkboard thread that many users were experiencing some troubles using it, like a drop in the CV while patching it or so. Current board size is 191 mm x 35 mm. I designed the offset pot in a way that you can add and subtract an offset. Could be useful as well without the input 0 signal, but then I need to add a termination to the inputs, currently the input impedance is very high, which would cause noise if not connected. What input impedance is usually used for these modules for CV inputs? For the sum circuits I used the OPA4180 quad op-amp. This has a very low offset (75 uV max) and zero-drift (0.1 uV/°C). I buffer all inputs, so you need 3 of it.One costs EUR 3.4, see https://www.digikey.de/short/3vtv59 . The 10k resistors have to be very precise for summing everything exactly with the same weight of 1 (by adding some more pots you could change the weighting). +/-0.1% and +/-50 ppm/°C should be fine, costs 0.31 EUR, : https://www.digikey.de/short/3v3tqt . All inputs and outputs are protected with extra diodes for ESD events. The series resistors at the output for this protection results in an output imdeance of 2 kohm. What is usually used as the CV output impedance? The 6.35 mm jacks are expensive, I could only find one for EUR 2.52, https://www.digikey.de/short/3vt0n5 which can be soldered directly to the board and mounted on a panel. Or is 3.5 mm possible, too? Could be really small then. What range is the CV? I assumed +/-10V (negative CV for inputs 1-3, and subtract if input 0 is negative, is possible, too) and a power supply of +/-15V and GND. What power supply connection and voltage is usually used for such modules? I guess all parts would cost less than EUR 40, including the board. Then add a panel and a case, and it could be a useful product. Wow that's amazing what you've done! I'm impressed and grateful that you took such an interest on this idea. I can't answer your technical question about electronics cause I've no idea how to built a module. But maybe someone could or we can take this thread on the DIY section. Maybe you could also post your design there. Thanks, that's interesting. The TL072 for the 2 to 2 module has a very bad max offset voltage of 10 mV. This means with the usual 1 V per octave (if you use it for pitch) for example with 1000 Hz, there could be an error of up to 7 Hz after one op-amp stage. But the other op-amp in this circuit, the OP4171, looks nice. Very similar to the OPA4180 which I found, but more output current, and the offset voltage is max 1.8 mV, compared to 75 uV of the OPA4180. This would be an error of about 1 Hz for 1000 Hz, should be ok, if the TL072 is already ok And the OPA4171 is a bit cheaper than the OPA4180, and has 4 kV input protection instead of 1 kV, so the input protection might not be needed. The circuit shows 51 ohm output impedance. This means I could use a 100 k input impedance, as used in the 2 to 2 module, and would not need an extra input buffer. For unconnected inputs there is a 10 meg termination, which should work to avoid any noise. I guess this could be done now all for maybe EUR 30, I will change the circuit tomorrow. What jacks do these modules usually use? Mini jack sounds like 3.5 mm, not the bigger 6.35 mm connectors? And looks like the usual power supply is +/-12V for the mutable-instruments modules, and +/-5V for the CV range. If these are the usual values, I can change my circuit accordingly (only the voltage regulators for the offset potentiometer, it would still work with both, +/-12V or +/-15V). Your initial circuit wouldn't have worked well, because it has a very high output impedance (2k), which would have introduced a 0.98 gain coefficient when patching the output to the typical Eurorack input - which has a 100k impedance. The solution for that is to either lower the output impedance (as low as you can go without risking to damage something when you mistakenly connect an output to another output) - what I did on Links because it made the PCB routing easier - or to put the output current limiting resistor in the loop (check Shades' schematics), which is what I'd to here if the goal is precision. The typical Eurorack input impedance is 100k. It's a kind of implicit standard. Transposition up/down 10 octave is quite a wild range. If you want to provide a manual transposition pot, maybe narrow it to +/- 2V. Bipolar audio and CVs are usually +/- 5V, unipolar CVs and logic signals are +5V, +8V or +10V depending on the brand. Thanks, I'll use the 51 ohm output resistance. In the Mutable Instruments circuit, the resistor is not in the feedback loop, but if the usual input impedance is 100 k, the error would be minimal (less than 0.1%) and it gives a bit more protection, if the op-amp input is not directly connected to the output connector. And the resistor gives a bit of protection for the output, but the op-amp itself is protected against short-circuits indefinitely anyway. So should be ok with the resistor, even when two outputs are connected together. Good idea to limit the offset to +/-2V, because this would result in a better resolution as well for this range. I could use trim-pots and an adjustable voltage regulator like LM317/LM337, if the user wants to change the range, which would even allow to reduce it to +/-1.2V minimum, or other users might want +/-5V, and with a factory default of +/-2V (in case I manufacture it). I don't know if 2 hp is a good idea, it is really small. If I use 4 hp, I would have some more space for the potentiometer and the switch, and I can get a blank front panel for cheap from here. * When the offset pot is set to the maximum and minimum, SW1 will short U2A (or U2B)'s output to ground. * You might need a cap between the output of your op-amp and V- - otherwise you might get overshoot when driving long lengths of cable. * When patching a cable into input 1, 2, or 3, R3, R4 or R5 will be temporarily disconnected from ground before being connected to the external voltage source - causing the output voltage to temporarily jump by a factor or 2. Same issue when plugging something in/out of input 0. I've never been a big fan of this kind of non-inverting summing circuits! This thread has evolved considerably but I feel as though the Toppobrillo Quantimator should have been in the initial list. Thanks, I might have smelled the short problem when testing it Attached is a fixed version, and with the additional capacitors. I don't think it is a problem that the signal jumps when patching it, because it would be only for a very short time, probably not distinguishable from the other noise and clicks that could happen when you connect or disconnect a cable. And maybe I should use 2 hp, because space is always precious in your rack, and it might not need more. Does anyone know where I can buy a standard 2 hp Eurorack blank panel? Just in case I want to produce and sell such modules later commercially, where can I order good custom made panels with drills and labeling? frankbuss I can't help you with your design, because my skills in electronic are really limited. Thankfully, Pichenette is here helping, and he is a really really good designer. IMO this module shouldn't be bigger than 2 HP, because 2 HP is large enough to accommodate 7 mini-jack sockets and a pot. The pot itself won't be wiggled as much as a filter cutoff, so a small one should be ok. And you won't have to access it that much. HP are really expansive in euroland. initially the WK1 is an 3-to-1 bufferer mixer normaled to the 1-to-3 buffered multiple. he's using 0.05% tolerance resistor and tried using is adder for pitch transpose on a braid with clear success. I think that the pot transpose function may not be necessary in such a module. I does make sense when you have only one voice to transpose, but with 3 different voices, I don't know. In the other hand, a copy of the transpose signal might be really handy.